Ariana Grande has yet to perform at 2019 Coachella, but she's already making history at the iconic music festival. "Humbled and excited as all hell @Coachella," the 25-year-old shared on Twitter after it was announced she was set to headline night three both weeks of the festival. "Thank U." While she humbly didn't brag about the history-making performance, her manager Scott Braun was more than happy to do so on her behalf. "See you in the [desert]. @arianagrande 4th female to ever headline and the youngest headliner in the history of the festival!" the proud Braun posted on Instagram. "History congrats Ari. #coachella." Oh yeah, that's right: Ari is only the fourth female artist to headline the event as well, following in the iconic footsteps of Beyoncé, Lady Gaga and Björk. To sum it up: Ariana's performance is a big freakin' deal and the desert is ready for Arichella. Ariana's Coachella performance comes after a year and a half of ups and downs for the pint-sized singer, and close to one year from the release of the first single off her 2018 album, Sweetener. Weeks after the release of "No Tears Left to Cry," the first single off of Sweetener, Ariana confirmed her split from rapper beau Mac Miller. By the end of May, Ari made her new romance with Saturday Night Live's Pete Davidson Instagram-official, kicking off what would become a whirlwind romance that would play out in the public eye. "It's hard to talk about because so many people have suffered such severe, tremendous loss. But, yeah, it's a real thing," Ariana, who suffered from anxiety and dizziness, told British Vogue. "I know those families and my fans, and everyone there experienced a tremendous amount of it as well." She continued, "Time is the biggest thing. I feel like I shouldn't even be talking about my own experience—like I shouldn't even say anything. I don't think I'll ever know how to talk about it and not cry." Ariana held a benefit concert to raise money for the We Love Manchester Emergency Fund just one week after the devastating day. One Love Manchester lead to each of the 22 victims' families receiving $324,000 - $13 million. The singer then continued her tour as a tribute to her late fans. Music became a version of therapy for Ariana, who said, "Everybody thought I was crazy when I got home and wanted to hit the ground running. I was in the studio the next day. I am a workaholic." "I have no wish," she wrote on a photo of Davidson on her Instagram Story in June, the night before her 25th birthday. "I have everything I ever wanted hi." And one month after confirming their relationship, was revealed Ariana was engaged to Davidson, with their romance clearly inspiring Ari's work, with "R.E.M." was all about their fast-paced relationship and "Pete Davidson" being added as tracks on Sweetener, which came out in August after months of anticipation and promotion. "It's so crazy. It's been a wild ride," she said on Aug. 25 at the L.A. edition of her Sweetener Sessions. "I don't know what the f--k I did to get so lucky." But in September, Ariana's world was rocked when Miller, 26, suddenly died from mixed drug toxicity. Following his tragic passing, a source told E! News Ariana was "truly devastated." "I adored you from the day i met you when i was nineteen and i always will. i can't believe you aren't here anymore. i really can't wrap my head around it. we talked about this. so many times. i'm so mad, i'm so sad i don't know what to do. you were my dearest friend. for so long. above anything else," Ariana wrote on Instagram. "I'm so sorry i couldn't fix or take your pain away. i really wanted to. the kindest, sweetest soul with demons he never deserved. i hope you're okay now. rest." Initially set to attend the 2018 Emmys later that month, Ari's team announced she was no longer going to the event. "Given the events of the past couple of years, Ariana is going to take some much needed time to heal and mend," her team said in a statement. "She will be staying close to home and using this period to spend time with her loved ones and work on new music without deadline." "She has been struggling emotionally and is not in a situation where she should plan a wedding," a source told us. "She had to take a step back and just breathe for a minute. She's been completely overwhelmed and wants to slow down." After an emotional and eventful year, Ariana returned to her "happy place": the recording studio. Following the split, a source told E! News that Ariana "wants to pour her heart and soul into her music, and being in the studio really helps her deal with her emotions." And that's exactly what she did, putting out her most successful album to date. Thank U, Next, which she called a "a more honest n vulnerable" album, provided Ari with her first No. 1 single on the Billboard Hot 100 with the title track, which also broke the record for most plays in a single day by a female artist on Spotify. And then there was the infamous music video, which paid homage to classic rom-coms like Mean Girls, Bring It On and Legally Blonde, and featured cameos from Mean Girls star Jonathan Bennett, a slew of Ari's former Victorious co-stars and Kris Jenner, who infamously says, "Thank you, next, b—ch!" in the record-breaking video. "7 Rings," her follow-up single off Thank U, Next, performed even better, remaining atop the Billboard Hot 100 for eight weeks. She also became the first female artist to replace herself at No. 1 on the UK singles chart with the release of the third single off the album, "Break Up With Your Girlfriend, I'm Bored." 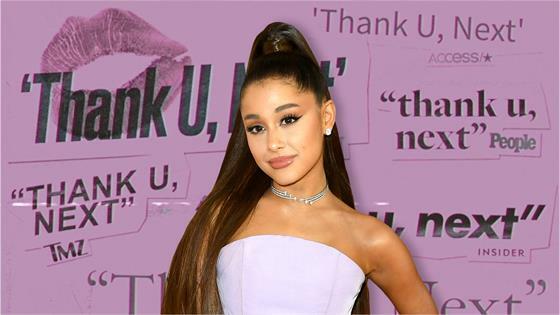 To cap off Thank U, Next's success, Ari celebrated another career milestone in February, winning her first-ever Grammy, taking home the award for Best Pop Vocal Album for Sweetener. Ironically, it was a bittersweet victory, as Ariana, who was originally supposed to perform during the show, ended up boycotting music's biggest night after a public disagreement with Grammy producers over her set list. You'd think after releasing two back-to-back albums, winning her first Grammy, and you know, going through everything she had been through in her personal life, Ariana would need some much-earned rest. Well, you'd be wrong: She kicked off her Sweetener World Tour on March 18 and will be touring until October. During the tour's kick-off in Albany, New York, Ariana paid tribute to Miller, with many of her late ex's songs playing in the background before she took the stage. Aside from the obvious reference to the rapper in "Thank u, next," many fans believe the song "Imagine" was also about her ex, whom she dated for two years. Before Ari's headlining turn in the desert, just three woman before her snagged the top spot at Coachella. But Bey, who was the first woman of color to headline the fest, more than made up for it when she took the stage in 2018, delivering an iconic performance, which featured appearances by Jay-Z, her Destiny's Child band mates, and Solange, as well as over 200 dancers and a full marching band. The performance lasted over two hours and "paid homage to America's historically black colleges and universities." On April 17, Beyoncé's documentary Homecoming: A Film By Beyoncé, is set to drop on Netflix, which will give fans an "intimate" behind the scenes look at the preparation that went into her Coachella performance. So what can fans expect from Ari's own history-making performance? "similar but w many surprises and a few more songs," she responded to fan on Twitter asking if her Coachella performance would be similar to her tour, which has included some emotionally challenging moments for the singer. "thanks for accepting my humanness. it's super emo and difficult singing some of these songs. but you make me smile," she wrote to her fans on March 26 after her show in Washington, D.C. While she's yet to share exactly what her history-making Coachella performance will look like, one thing's for sure: Despite the highs and lows of the last few years, Ariana has managed to come out on top, "healthier" and more successful than ever. "it feels sm healthier & sm more authentic & rewarding. regardless of the outcome, i prefer this bc it's real & feels happy. no games," she wrote on Twitter. "i love music. i love the ppl i make it w. these past few months made me fall in love w this job all over again."